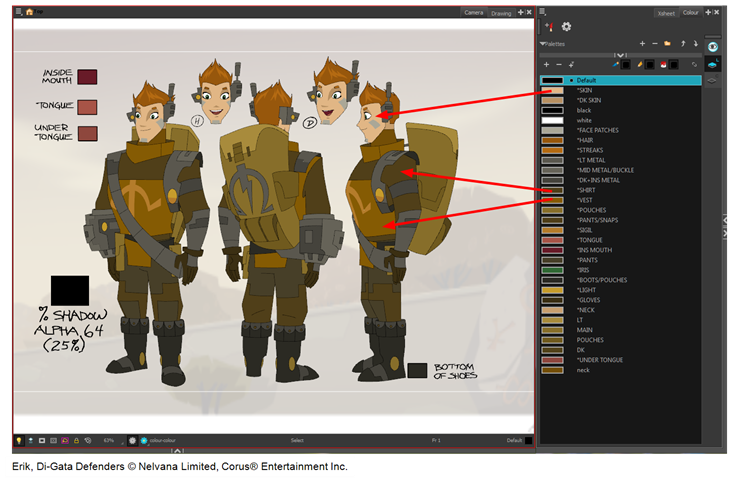 In animation, specific colours are used to paint each particular character. In order to maintain absolute consistency, a colour palette is created for each character, prop and effect throughout the production. This is referred to as a master palette. Master palettes contain a colour swatch for each zone to colour with a precise RGBA colour value. • Each character consistently retains their dedicated colours. • You cannot accidentally use a colour which is not in the master palette. • Multiple artists can use the same colour palette and produce the same results. Toon Boom Harmony uses palettes to hold all the colours needed to paint your elements, allowing complete control and consistency in your painting process. A palette is created by assigning a set of colours to each character, prop or effect. You will create a new palette and add a new colour, known as a colour swatch, for each zone of the character, such as the skin, hair, tongue, shirt, pants, and so on. In Harmony, palettes are individual files that you can copy, transfer, and store. Palettes have a *.plt file name extension—see Palette File Storage. When a zone on the character is painted with the colour contained in a colour swatch, a link is automatically created between that colour swatch and the zone. This means that if the tint of the colour in the colour swatch is changed, any zone linked to it will update to the new tint. This is one way that colour palettes can save time and money in your production.